Consultation liaison psychiatry services (CLPS) are, typically, based in a general hospital setting to provide the dual services of mental health clinical assessment/treatment and clinician support/education. The clinical and education roles overlap – a lot. A significant part of the CLPS job is undiagnosing mental illness. Undiagnosis is often correcting a misdiagnosis, and also serves to validate the emotions and experiences of people (Patfield, 2011; Lakeman & Emeleus, 2014). It is not unusual for CLPS to be asked to see somebody who is emotionally overwhelmed or dysregulated. Sometimes this is in the context of mental health problems often in the context of significant stress. Naturally, we do not want to ‘psychiatricise’ the human condition. Of course, you cry when you are sad, and of course you are anxious when, like Courtney Barnett in ‘Avant Gardener’, you are not that good at breathing in. Of course, you’re frustrated when you are in pain or do not understand what’s going on. Validating understandable and proportionate emotions is important. It is equally important to make sure that somebody who has experienced mental illness previously does not have every presentation to the hospital/outpatient clinic seen through that lens. That is called “diagnostic overshadowing”; which is a significant problem. Diagnostic overshadowing is where physical symptoms are overlooked, dismissed or downplayed as a psychiatric/ psychosomatic symptom. It must be one of the most dangerous things that happen in hospitals. The President of the Royal Australian and New Zealand College of Psychiatrists, Professor Malcolm Hopwood, said in May 2016, “I sometimes think that the worse thing a person can do for their physical health is to be diagnosed with a mental health disorder.” Prof Hopwood cited stigma and discrimination in the health sector as contributing problems to early mortality amongst people with mental health problems. People, hospital clinical staff included, are often shocked when they find out that people diagnosed with mental illness die between 10 and 25 years younger than the general public. Although suicide is a contributing factor to high mortality rates amongst this part of the community, it is alarming to note that the overwhelming majority – 86% – of people with mental health problems who had a premature death did not die from suicide (Happell & Ewart, 2016). About 60% of people who experience mental health problems experience chronic physical health problems too. Poor mental health is a major risk factor for poor physical health, and vice versa (Harris et al, 2018). Eight years ago I was diagnosed with bipolar affective disorder (BPAD) and recovered enough to commence a PhD. Unable to obtain travel insurance for a conference due to my diagnosis, I disclosed the reason to my supervisor. Unfortunately, he began to see all stress (normal to a PhD student) as BPAD symptoms and decided I was incapable of completing the PhD and progressively began to discriminate against me. My mental health started to decline. I imagine this must have validated his belief that I was an unsuitable student. I received some help from the university, with an advisor indicating that my supervisor was undermining my work. The advisor was promoted. Despite not knowing me, his replacement did not believe my account and disagreed with my psychiatrist’s assessment of my mental state. Other staff and graduate students joined the belief that I could not cope, alienating me from the entire department. After almost 18 months of fighting, I was once again depressed and felt defeated. I left the degree and lost my scholarship. It was one of the hardest things I have done. After, I was unable to gain employment; overqualified for most positions, lacking experience for the rest, and no references. After five months of constant rejections and lingering grief from losing the PhD, my self-worth and coping ability were so diminished, I made a very serious suicide attempt. I was so distressed that I could not see another solution. Seven months later and I still have no paid employment. I have been undertaking volunteer work to regain some meaning in my life and have set myself up for the long-term with a new field of study. However, this does not pay the bills, and living like this is taking its toll. Sometimes I do not know where my next meal will come from, I have lost friends because of their attitude towards mental illness, and have withdrawn from health-related activities because of a lack of finances. Most days I cope and can find meaning in what I do, some days are much harder. Assuming that you – the person reading this – is a health professional, we have some questions we would like you to reflect on. Have I ever witnessed a person’s mental health history influence how their presenting complaint was investigated or treated? How does my workplace prevent mental health stigmatising and diagnostic overshadowing? What can I do to support good holistic patient care without falling into the trap of diagnostic overshadowing? Happell, B. & Ewart, S. (2016). ‘Please believe me, my life depends on it’: Physical health concerns of people diagnosed with mental illness. Australian Nursing and Midwifery Journal, 23(11), 47. Harris, B. Duggan, M. Batterham, P. Bartlem, K. Clinton-McHarg, T. Dunbar, J. Fehily, C. Lawrence, D. Morgan, M. Rosenbaum, S. (2018). Australia’s mental health and physical health tracker: Background paper. Australian Health Policy Collaboration issues paper no. 2018-02, Melbourne, AHPC. Lakeman, R. & Emeleus, M. (2014). Un-diagnosing mental illness in the process of helping. Psychotherapy in Australia, 21(1), 38-45. Patfield, M. (2011). Undiagnosis: An Important New Role for Psychiatry. Australasian Psychiatry, 19(2), 107–109. McNamara, P. & Callahan, R. (2018). Diagnostic Overshadowing. 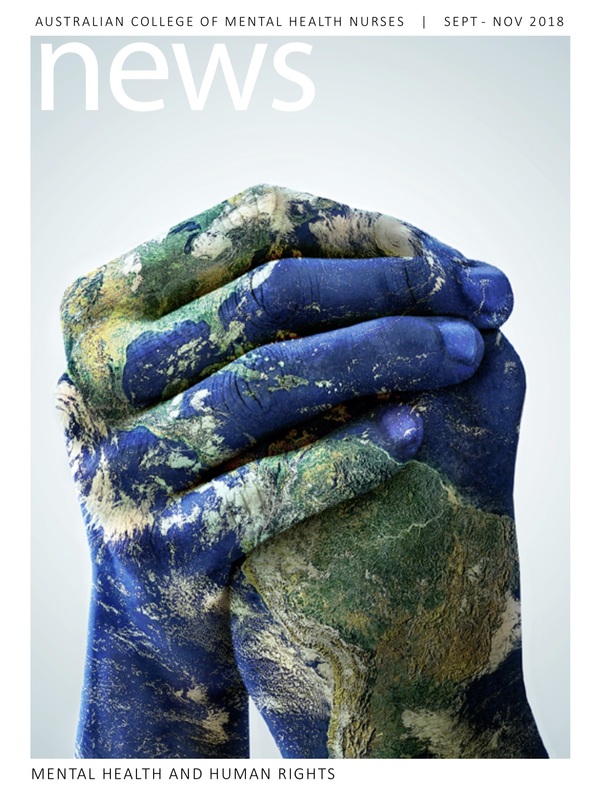 News, Summer 2018 edition (published December 2018), Australian College of Mental Health Nurses, page 17. 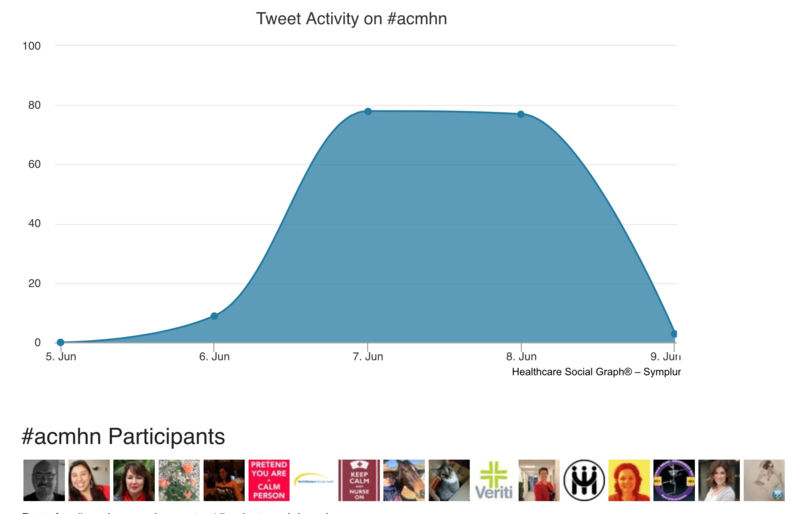 Many thanks to Sharina Smith for encouraging us to submit the article to ACMHN News. This entry was posted in Blog and tagged ACMHN, consultation liaison, diagnostic overshadowing, education, emotional intelligence, lived experience, mental health, nurse, nurses, nursing, nurturing, suicide on 15 December 2018 by Paul McNamara. This page serves as a place to collate the Prezi, YouTube video, abstract and list of references, data sources and visuals used for a presentation at the 44th ACMHN International Mental Health Nursing Conference. Paul McNamara is CNC with the Consultation Liaison Psychiatry Service at Cairns Hospital. 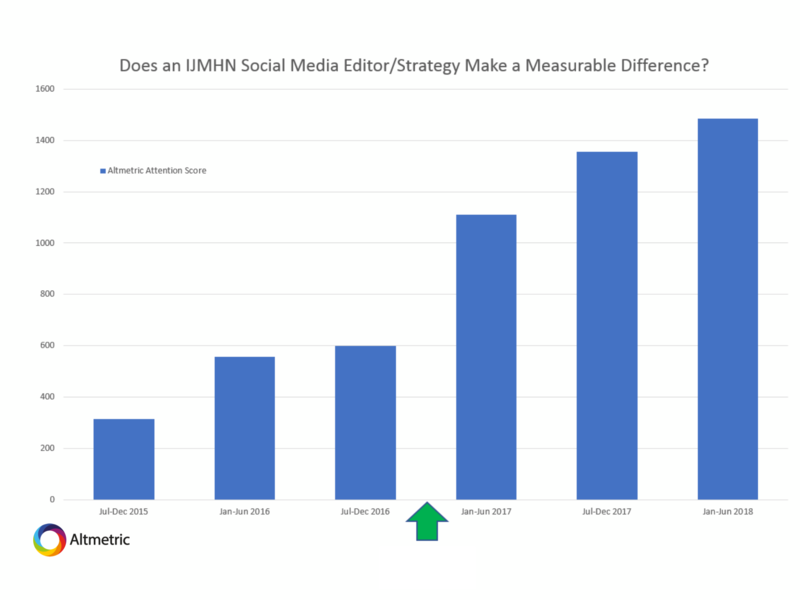 Paul is also Social Media Editor of the International Journal of Mental Health Nursing. Kim Usher is Professor and Head of School at the School of Health, University of New England. Kim is also Chief Editor of the International Journal of Mental Health Nursing. Traditionally the impact and reach of a specific journal article has been estimated through the measurement of how many times it is cited elsewhere in scholarly literature. Sometimes years could pass between conducting the original research, writing and refining drafts, submitting and reviewing manuscripts, the article being published, and subsequent researchers including this citation in their published reference list. The resulting time lag means that citations are a retrospective measurement of research impact. There is however an alternative measure of research impact; a metric that is more immediate. This alternative does not rely on the passive hope that other people will see and share research findings, but allows interested parties to play a hand in generalised and targeted promotion of a published piece of research. Charlene Li famously described social media not as a technology, but as a conversation (Israel, 2009). Now these online conversations can be quantified, and offer “real‐time” feedback to researchers/authors about the impact and reach of their published research. In order to support these claims, we will provide an overview of the International Journal of Mental Health Nursing social media strategy. Altmetric data will be presented to demonstrate the measurable effects of this strategy. General information and specific examples will be shared so that researchers, authors, and the institutions that support their work, are exposed to strategies they could use to contribute to future Altmetric scores. In doing so, conference delegates who attend this presentation will be equipped with knowledge on how to improve the impact and reach of their publications on social media, and further their understanding of why this matters. 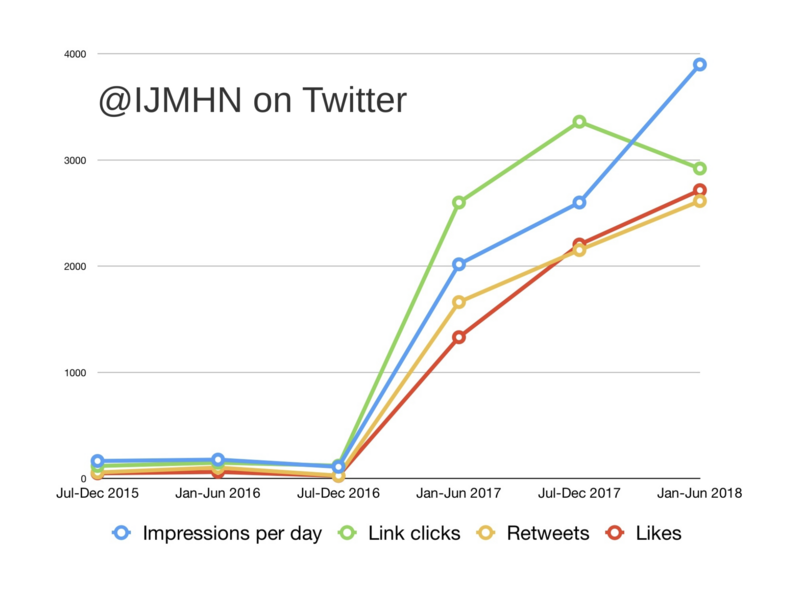 Altmetric attention scores re IJMHN impact from July 2015 to June 2018, MS Excel spreadsheet data courtesy of Kornelia Junge, Senior Research Manager, Wiley. Israel, S. (foreward by Li, C.). (2009). Twitter Ville: How businesses can thrive in the new global neighborhoods. New York: Portfolio. 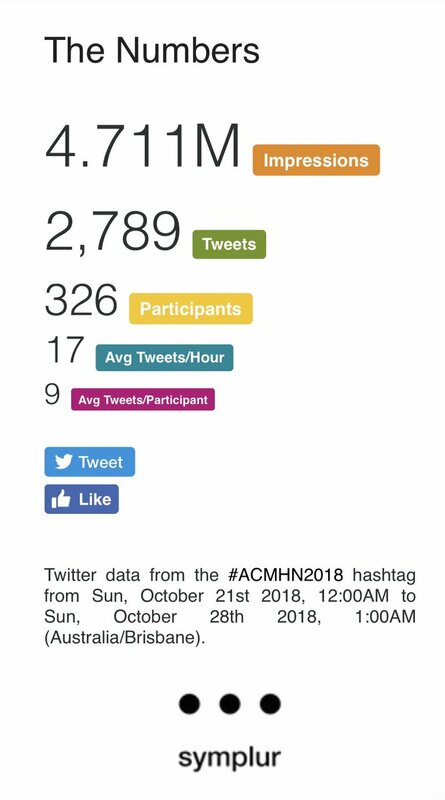 Using Hootsuite, these Tweets using the conference hashtag (#ACMHN2018) were scheduled to be sent during the presentation. Look Mum! No Hands! Twitter is a hungry beast. 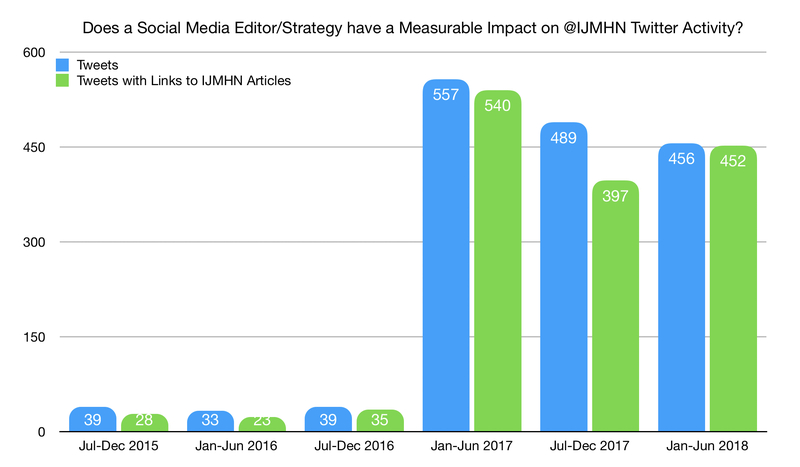 Does a Social Media Editor/Strategy have a Measurable Impact on @IJMHN Twitter Activity? In keeping with the theme of the presentation, I’d be grateful if you share the page with your social networks. As always, questions and feedback are welcomed via the comments section below. There was a flat spot in the original presentation where I struggled to convey clarity and sustain interest. In an effort to overcome this, I deleted a couple of slides from the original Prezi, modified another, and added the data/chart below. Thank you for your helpful critique and suggestions @StellaGRN. The Tweets that were scheduled to coincide with the presentation have now been embedded in the post. 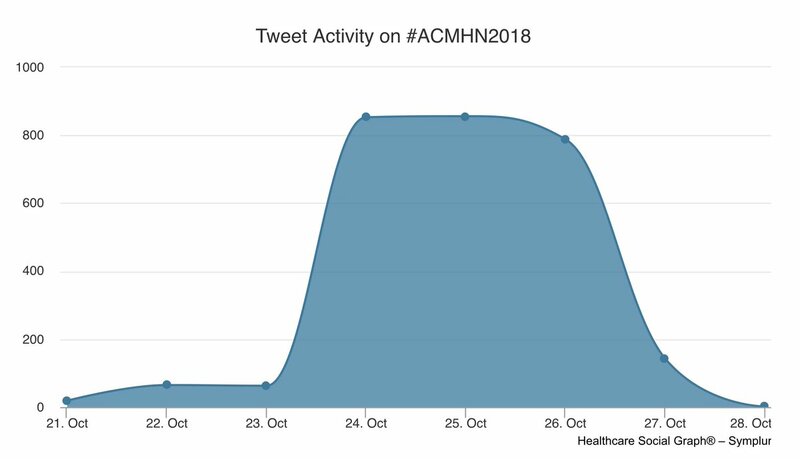 This entry was posted in Blog and tagged #ACMHN2018, #SoMe (Social Media), ACMHN, Altmetric, communication, conference tweeting, geeky stuff, IJMHN, innovation, mental health, nurse, nurses, nursing, Twitter on 15 October 2018 by Paul McNamara. 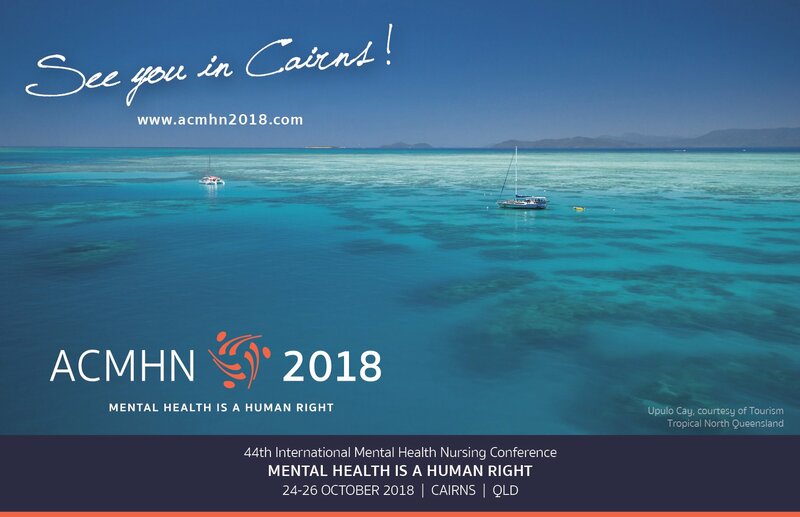 In October 2018 hundreds of mental health nurses will descend on Cairns for the 44th ACMHN International Mental Health Nursing Conference. 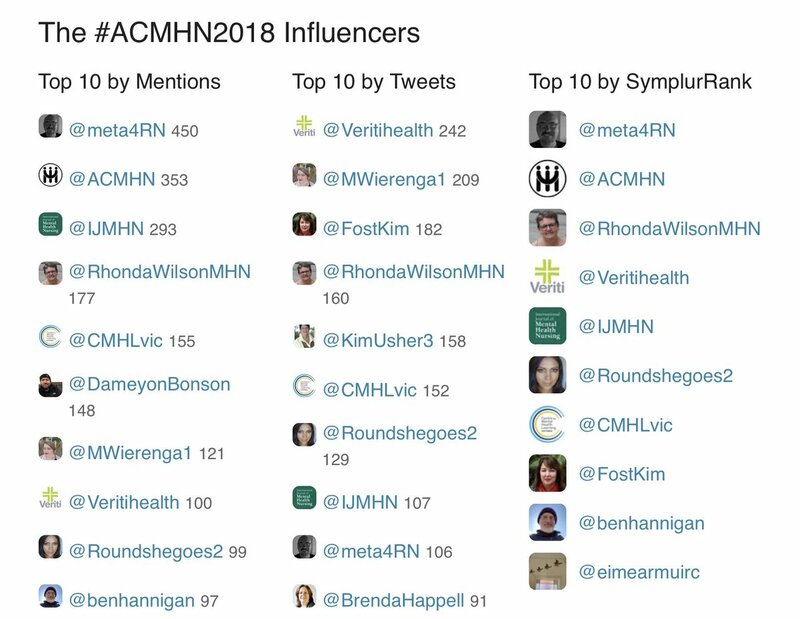 As part of pre-conference publicity ACMHN have put their “Top 5 Tips for #ACMHN2018 Presenters” online [link]. That got me thinking that it might be helpful to have some “Top 5 Tips for #ACMHN2018 Delegates”, ie: a local mental health nurse’s suggestions on what to do when you’re NOT at the conference. FNQ (Far North Queensland) is worth exploring – be sure to tack-on some rest and recreation time before and after the conference. Mondo is my favourite place for afternoon drinks or lunch. It’s a 500m walk from the conference venue. The location is fantastic, with views across Trinity Inlet and nearly always a cool breeze. Local’s tip: If you do decide to eat here try the sizzling fajita. Yum! Today I’m putting in the hard yards investigating suitable places for #ACMHN2018 delegates to eat and drink. Local’s tip: craft beer not your thing? the AIX Rosé is delicious! A 10 minute walk from the conference venue, Salt House has a new deck that overlooks the marina and a larger area where there is often live music. It’s cool and casual, and a favourite with the after-work crowd. Local’s tip: have the Bloody Mary oyster shooter! Do you have an image of a RSL as a dingy old place full of dingy old people? Forget it! From the conference venue take a 10-15 minute stroll along the lively, cosmopolitan esplanade to take a seat at the light and breezy bar with tilt-up windows. Situated just across Florence Street from the RSL, Vine Room is an open air, slightly elevated spot for an afternoon/evening drink. Watch the dive trips come in from the reef with a cool beverage. Vine Room is a pretty-good place to spot a cruise ship pulling-out of Cairns. Less than 200m from the conference venue, this groovy little place is great for just a drink, but the food is too yummy to miss. My favourites are the tapas dishes, which the friendly staff will match to your wines if you ask them to. Local’s tip: the specials are nearly always amazing! This seafood restaurant on The Nard (local speak for “The Esplanade”) is a great spot to watch the world go by while eating delicious things. It’s a 10-15 meander from the conference venue. The best Thai restaurant in Cairns is also on The Nard, but is a bit harder to find than the others. Look for the casual and fun Courtyard at street level. The door to the stairs taking you up to Iyara is to the right of the entrance to Courtyard. It’s a very good restaurant, and if you’re seated on the balcony you’ll be able to see the blinking lights of the shipping channel snaking out to sea. Local’s tip: the starter that has a prawn, lime and peanuts wrapped in a betel leaf is fantastic! Situated on the boardwalk of The Pier, Tha Fish overlooks the marina – it’s a 5-10 minute walk from the conference venue. Great food, great wine list and great service. If you found Mondo you can find Ochre – it’s just another 50m or so along the boardwalk that fronts Trinity Inlet. A creative menu using lots of native Australia ingredients. Classy! The boardwalk is a nice stroll, and well used by locals and visitors alike. If you do the whole thing it connects Hemingways to the mangroves near the airport, but that’s not much fun in full sun. Around sunrise or sunset it’s pretty nice though. Local’s tip: there are a couple of avenues of large trees that converge at the lagoon – go via the shade if it’s sunny! The markets are a couple of blocks from the conference venue fronting both Grafton and Sheridan Streets. They markets are well-worth a visit on a Friday, Saturday or Sunday. There’s a bit of standard hippy bling near the Grafton Street entrance, but the cool stuff is the food in the middle and Sheridan Street end of the markets. If there’s a show on at The Tanks that coincides with your trip to Cairns get there. Tank 5 is a fantastic venue to see bands/other acts. If there are no live shows that appeal sus-out any art exhibitions. The Tanks are about $10-15 in an Uber or $20-25 in a taxi from the conference venue. There’s also a bus (see below). Local’s tip: stinger season usually starts in November, but they can come early some years. For a sweat-inducing but beautiful walk head to The Red Arrow near The Tanks/botanic gardens. Green exercise is better for mental health than gym-based exercise, and when you’re puffing for breath looking down on the airport/city from Mount Whitfield you’ll notice a smile pass over your lips between gasps. You can see the Great Barrier Reef from outer space or from a boat from Cairns or Port Douglas. Boat trips are much cheaper than rocket trips, but it’s worth paying a bit extra for one that goes to the outer reef – that’s where the cool stuff is. Snorkelling is pretty easy unless you’re very unfit. Local’s tip: don’t pre-book your trip, watch the day-to-day weather forecasts before booking – ideally you’ll go on a day when the wind is 10kmh or less. Wake up early. An early start means you beat the tourist buses heading up to the Daintree. It doesn’t have to be a pre-dawn take-off, but this is written as if you’re in the car and driving at 7:00am(ish) – if you’re not on the road before 8:00am you’re too late. Drive north up Sheridan Street/Captain Cook Highway. If you didn’t get proper coffee before you left town, too bad: get it in the Daintree instead. You’ll drive past all the suburban beach turnoffs and Palm Cove in the way out of town. Relax. By leaving early you can see any of them on the way back. Drive through Ellis Beach. About 15-20 minutes later you’ll see the signs/parking area for Rex Lookout. Stop there for photos and fresh air. Lovely. Keep driving north, don’t turn off to Port Douglas: keep going towards Mossman. If you’re REALLY desperate for coffee you can try your luck in Mossman, but it’s better to keep driving. 20-30 minutes later you’re at the ferry that crosses the Daintree River. Get a return ticket, and officially start to relax. You’ve beaten the traffic. You’re in a lovely part of the world. You’ve crossed the river now. Chill. Soon after you get off the ferry you’ll see the sign pointing to Florence Lookout on the right. Take the turn. Take some photos. Now you’re less than half an hour away from stopping for breakfast. Keep driving north until you get to Thornton Beach. There’s a place next to the beach that makes good coffee and breakfast. You can take your time. Along the way there a free boardwalks. Take the time to walk along all of the free ones. There’s a commercial boardwalk/skywalk thingy too. You’ll see it advertised. It’s good, but so are the free boardwalks. You can choose to go on the paid boardwalk/skywalk on the way back if you want to. Putter your way to Cape Tribulation. There are lovely beaches there – check with a local on whether it’s safe to get in the sea (irukandji likely to be a bigger risk than crocs). Take your time. Late brunch/early lunch in Cape Trib. Soon the tourist buses will start arriving. You don’t care, you’re turning around and leaving Cape Trib now. Enjoy the drive south. Turn -off/stop wherever you want. Make sure you stop in at that tropical fruit ice-cream place you saw on the way up. After you’ve crossed the river again, plan to drop into Mossman Gorge on the way home. If you couldn’t swim before, you can here: fantastic clear, cold, croc-free fresh water. How’s the time going? You’ll be time to have a look at Port Douglas: make sure. to get photos @ Four Mile Beach, somewhere down the other end of Macrossen Street near the Courthouse Hotel. Hang a right, and go up to the lookout. Take your time driving home. Be sure to stop at Rex Lookout again (the light has changed, it looks different, there may be hang-gliders). Do you have time to stop at Ellis Beach? It’s more about the beach than anything else. Do you have time to stop at Palm Cove? It’s more about the bars and restaurants than anything else, but there is a nice jetty for a walk, and an irukandji net to allow safe(ish) swimming. There a few more beaches on the way back to Cairns. They all have different looks/qualities, visit whichever you like: most are only 10 minutes off the highway, Yorkeys Knob is more like 15. Mossman Gorge is beautiful. If you can’t get to The Daintree for whatever reason go here instead – it’ll give you a good taste of the wet tropics with the bonus of cultural context. Port is a pretty town which somehow maintains a small town feel despite all the tourist infrastructure. It’s definitely worth staying in Port for a night or two if you have time. 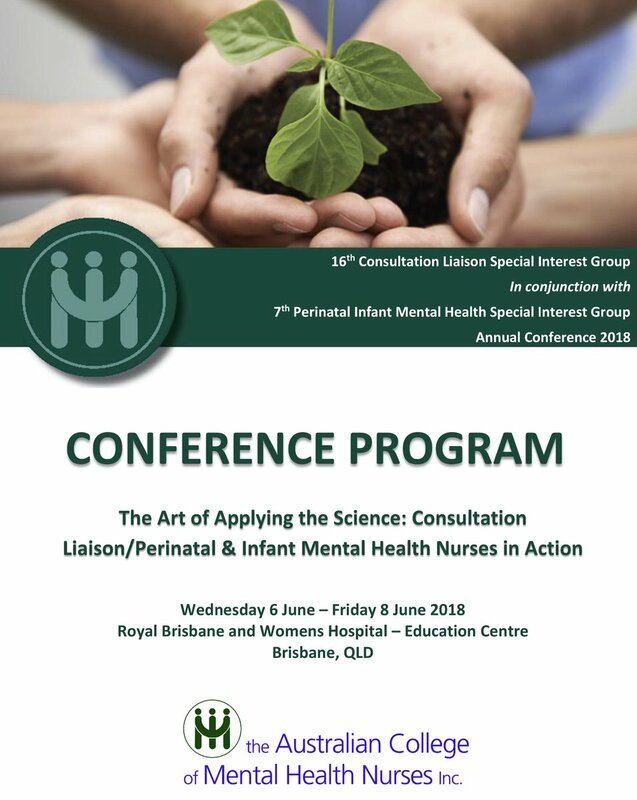 See you in Cairns for #ACMHN2018! 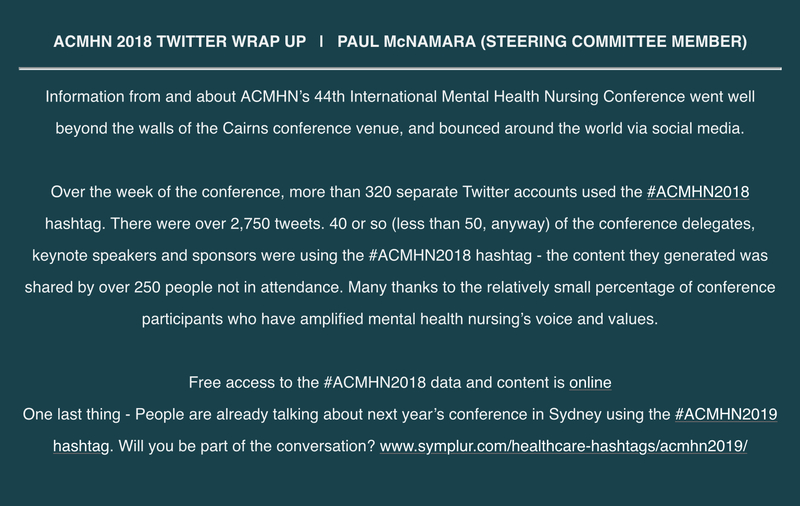 This entry was posted in Blog and tagged #ACMHN2018, ACMHN, cairns, conference, do, drink, eat, mental health, nurse, nurses, nursing, top 5 tips, visit on 27 August 2018 by Paul McNamara. PPT slide from the report given at the Australian College of Mental Health Nurses Consultation Liaison Special Interest Group Annual General Meeting on 5th June 2008. My team serves two digital masters: CIMHA (the mental health only file/application) and ieMR (the electronic general hospital file/application). Our flesh + blood masters have now suggested that we should stop documenting in ieMR. However, I want to see if there’s any CL service(s) that does NOT document in the hospital file. If so, how does it work? Do you spend a lot of time in coroner’s court? I can’t imagine not documenting in hospital/clinical file – what part of consultation are they missing? Sorry – this is a redundant reply to your question but can’t not respond. I agree it is dangerous and wrong. If we don’t write in the hospital file, how do our referees know what we advise, how else do we educate them? The nurses would often tell me that they loved reading my notes as it helped them make sense of what was going on. Definitely fight it. Do the other consult teams to the hospital have a separate file? I doubt it. The other justification is documenting a diagnosis for clinical coding, which may or may not be relevant to activity based funding depending on where you are working. The issue we have found in the NT with printing notes from an electronic system and placing them in the paper file, is the mental health notes often go missing, are filed incorrectly or do not even make it to medical records after discharge, meaning our input, suggestions and recommendations don’t make it into discharge summaries or correspondence for future presentations. Hence why we also handwrite in the file. I agree with you – I think it is dangerous to say the least. We currently primarily document in the general hospital file (as these patients are admitted under general medical teams) as the teams who refer to us are asking for advice, suggestions or assistance with these patients. We do not admit these patients to MH and have no beds. If we assess that the patient requires a MH admission only then do we refer and complete the required MH documents (which would go with the patient to MH). We are however, required to enter our patient contacts in to the statewide MH database in order to generate statistics for our service. I am lucky as we do not use the local MH electronic documentation system. Our patient files are still paper based. I would be concerned about the medicolegal aspects of not having your notes available to the general hospital staff. We use both systems (MH Community AND hospital EPAS). Given our clients/customers are the treating medical/surgical team it’s imperative we write all our notes within the clinical chart. At this hospital all clinical notes are uploaded into iEMR once the patient is discharged; this means our notes can be accessible by anyone with access to this system. As yet we don’t directly input notes into iEMR but I think over the years this will change. Because our notes are also useful to MHS we either write directly into CIMHA, print off the note and put it in the clinical chart or print off the note we’ve written in the clinical chart and then upload this into CIMHA. If a patient is clearly delirious with no mental health history we don’t usually upload anything into CIMHA, we just write in the clinical chart. It’s helpful for the referring teams to be able to ALL aspects of a patient’s care during in-patient stays, including MH input as when the patient is next admitted it gives them a more holistic view of the patient and encourages them to think more about how their MH problems may impact on their admission. I write in the hospital chart Progress Notes and then scan and upload to CIMHA the electronic MH record. The reason I do this is because CIMHA printouts get filed under correspondence and not chronologically in the Progress Notes of the patient chart. I often have the debate with MH clinicians who see a patient in ED or a general ward on the weekend, come back and write an excellent entry on CIMHA but the receiving medical team has absolutely no idea that the patient has been seen, what the outcome was nor any plan for ongoing review. how are any risk issues handed over to the medical areas? If an adverse event like a suicide/attempt happened would the coroner think notes on a database not accessible from the current treatment are or team or the current record be seen as satisfactory? how do any recommendation get carried over? I would also ask how MH would feel if cardiology came to review someone in the MH unit and returned to cardiology, noted their review on a bespoke cardiac notation system and not the record within MH and left it at that, if that would be seen as satisfactory practice and care. I suspect the scope to debate this would be well achieved through the accreditation standards, documentation and/or handover, would this pass the accreditors? I agree with the observation made regarding fact that the treating team caring for the person must be aware of all essential clinical details and interactions that all clinical services are providing to the person. For services that maintain separate mental health and medical records it is essential that the clinicians responsible for that episode of care (i.e. the inpatient staff) have ready access to the clinical record in the location they would be presumed to be consulting. I would strongly suggest this means mental health consultation notes should be entered into the ward medical record and a copy be provided to add to the mental health record. I have been aware of MH clinicians and managers occasionally expressing anxiety about non-specialist health staff accessing mental health documentation for fear that clinicians will inappropriately access and use such information. All health employees in Australia are bound by a code of conduct which strictly prohibits the inappropriate access to and use of privileged information from a clinical record – the consequences of breaching this element of the code of conduct can be quite serious. One of the benefits we have in our health service in NSW is that the majority of our services are now recording in common electronic files (EMR), meaning the issue of which file to record a clinical intervention in is not an issue, and any time a clinician accesses those records a digital finger print is left on the file. This means any time a clinician accesses a file without just cause there is evidence that a breach of confidentiality has occurred. It is interesting this discussion has arisen now as it has been the hot potato topic of our area and specifically my role in recent months. Prior to the review I had been documenting in the clinical file AND our electronic community record CHIME, double dipping if you please, and very time consuming. It is now the case that I write in the clinical notes, but I will also in addition complete a form based comprehensive mental health assessment for those patients who are being referred to the MHS. That form is scanned and emailed to an email address specifically set up for each CMHT, it is then added to the electronic file, the original assessment form remains with the patients hospital file as correspondence. CLP writes notes in CIMHA and places them in the medical record in the relevant admission or community section of the medical note. This seems to flow smoothly here and has the advantage that if the consumer is discharged to a rural area the CLP notes are available to general hospital staff in the viewer. We use the CLP templates which are in CIMHA. The community mental health teams no longer write notes in medical records. Their notes are all recorded in CIMHA and no hard copy is placed on the medical record. We used to have two separate files but now have EMR and record directly on to the medical file under mental health (there is a function to put it “behind the glass”) so you can record more sensitive information if necessary. Someone has to “break the glass to look at it”. We’ve had this system now for about 18 months and it has cut down our paper work enormously. Anyone we refer within our region to the community can be accessed through their own service on EMR and we link our referral to the UR of the patient. So just for those in Victoria, so you know, once they hit the adult system you will be able to see their registration date etc and can always make contact for more info. This thread is particularly useful, thank you! The clients/patients we see via telehealth, have an open encounter/MRN/electronic Medical Record (eMR) – including community/inpatient – in the referring/responsible LHD, and we need to create a new encounter/MRN/eMR in my LHD. I then extract notes from eMR, create a letter of feedback (impression and recommendations) which I email same day, with request that the MH Clinician at the other end upload the feedback into their local eMR, then to maintain privacy, delete the email and attachment from their inbox and deleted folders. Uploaded files/feedback appear in ‘correspondence’ which as pointed out in this thread, need to be hunted for. Getting the feedback into the eMR also relies on the receiving Clinician to access their email and process it. Many of the women we see are at high risk of relapse or first episode psychosis around the time of childbirth so Maternity Services would benefit from seeing our notes. I have taken initial steps toward a pilot project whereby we may be able to write directly in the eMR in the other, usually rural LHD. We document in the hospital paper file in the episode of care. Our system here is all eMR and went this way last year with MH going this way before the major hospital. So anyone can see anything from D&A, MH, general inpatient and community services. There are just a couple systems that work differently (oncology – which includes our psych oncology outpatient) and maternity. It has made life so much easier to be able to see recent interactions and it has also stopped the need to fax assessments etc as it can be seen. Like others, if it is an individual who is from outside our area health, we fax it and give verbal handover. I would be very worried for all the reasons that others have stated in relation to medico-legal issues as well. Thanks to everyone for your generous and thoughtful responses. I had been given the impression that there was something peculiar about my stubbornness on the matter. The reassurance and wisdom of the CL Nurse community is very much appreciated. Attached is a deidentified version of our conversation about documentation in consultation liaison. The title will make for a good rap refrain. I’ve left-out names of people and hospitals/districts, and the side-conversation re timeliness (no offence meant; hopefully none taken). I didn’t ask the question to gather data for a conference presentation, but I might use the attached for something more academic than a funky rap refrain. If you’d rather your info be excluded please contact me directly (off-list). There may be others who battling the same/similar issues. This page is googleable, so may be of assistance. The conversation isn’t about nuclear missile launch codes. There’s no need to keep it secret or hidden away from the world. I, and others who are interested, will be able to find the conversations (ie: qualitative data) quickly and easily PRN. As always, your comments and feedback are welcome in the space below. This entry was posted in Blog and tagged #LiaisonPsych, ACMHN, consultation liaison, documentation, email list, email network, mental health, nurse, nurses, nursing on 20 February 2018 by Paul McNamara.